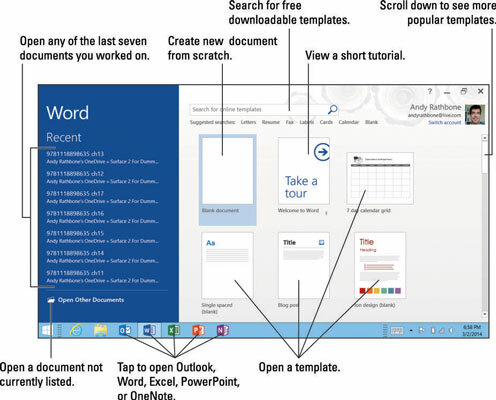 From the Start screen, tap the tile of the program you want to open: Word, Excel, or PowerPoint. If you don’t spot your desired program on the Start screen, you can also launch it directly from the desktop: Tap the Desktop app’s tile. When the desktop appears, tap your desired program’s icon from the desktop’s taskbar, that strip along the bottom, and your chosen program fills the screen. When your chosen program appears, tap the file you’d like to open. Open a recently accessed document. The Recent pane along the left edge lists your seven most-recently accessed documents. Tap a document’s name, and it returns to the screen, ready for more work. Start a new document. Tap the Blank Document icon, and the program presents a blank page, ready for you to begin creating a new document from scratch. Open a template. Office’s time-saving templates come preformatted, letting you concentrate on the content rather than the format or design. Search for a new template. Hundreds of free templates await online. For example, type resume into the Search box, press the Enter key, and choose among dozens of preformatted resumes. If you want to open a document not listed here, move to Step 3. Tap Open Other Documents, navigate to your existing document, and load it with a tap of the Open button. Tap Open Other Documents from the bottom of the Recent pane, and the Open window appears. The Open window lists your storage areas in the center column; to the right, it lists the currently selected storage area’s most recently accessed folders and documents. Recent Documents: The opening screen lists only your past seven recently accessed documents. This area, however, shows the past 24 documents you’ve opened. If you’ve opened the document before, chances are good that it’s listed here, waiting to be opened with a tap. OneDrive: Tap here to open files stored on OneDrive. By storing your files on OneDrive, you can work on them either from your Surface or your desktop PC. Other web Locations: Most often used by corporations, this option lets you access folders stored on other websites. Computer: A popular choice, this option shows recently browsed folders. It also offers a Browse button, where you can open files already stored on your Surface or any files stored on an attached flash drive or portable hard drive. Add a Place: Tap this shortcut to add other online storage places as Microsoft begins supporting them. Tap the Browse button to navigate to documents inside a storage area.Then open your desired document with a tap on its name. When searching for a document you’ve worked on previously, scan the Recent sections first. Tap likely suspects and take a peek. Guessed wrong? Close them with a tap on the File tab along the top and then a tap on the Close button in the program’s left pane. Tap the Open button to start again. Can’t find a document anywhere? Fetch the Charms bar by sliding your finger inward from the screen’s right edge and then tap the Search icon. In the Search box, begin typing a keyword contained in your wayward document. Below the Search box, your Surface lists every file containing the word you typed. To find and edit a file stored on a newly inserted flash drive or portable hard drive, tap Computer in Step 3 and then tap the Browse button. When a miniature File Explorer window appears, tap your flash drive’s letter in the This PC section of the Navigation pane along the miniature window’s right edge. 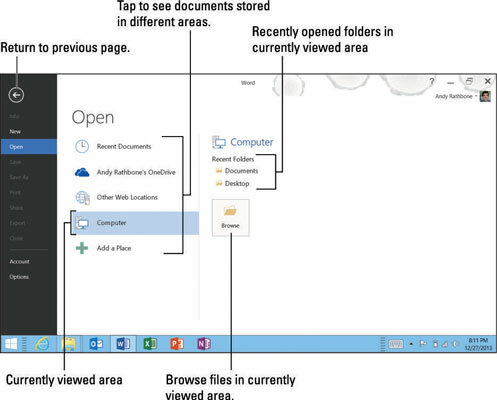 You can also open documents directly from File Explorer. If you spot your desired document on your recently inserted flash drive, double-tap its name: The program that created the document appears with your document in tow.